Kudos from Scott Canty: "This painting is full of mystery. 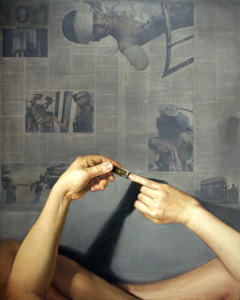 A person sits with hands hovering over a newspaper page open to images of war. We see in the upper part of the painting a photo depicting a young person in the newspaper, missing one arm, head bandaged, face in anguish looking towards the viewer. I sense the artist is making a comment on the insensitivity in which this person reading the newspaper, all the while casually clipping their finger nails. Have we become too blind to the effects of war, societal problems, or other ills that are around us? Where is our compassion?"